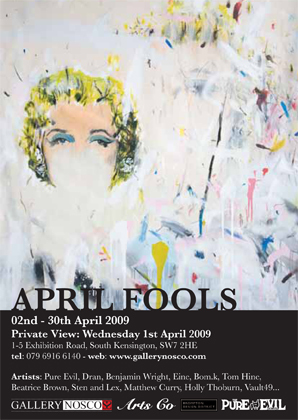 April Fools’ Day, although not a holiday in its own right, is a notable day celebrated in many countries on April 1. The day is marked by the commission of hoaxes and other practical jokes of varying sophistication on friends, family members, enemies, and neighbors, or sending them on fool’s errand, the aim of which is to embarrass the gullible. Urban street art has fast become a cultural phenomenon sweeping the UK and Europe with its audacious challenging of authority and cultural norms. Public but anonymous, these artifacts of clandestine performance by artists operating outside the established channels of exhibiting and selling their art, has contributed greatly to the dialogue of the enduring question, “What is art”? Taking the ethos of the hoax into consideration,†an eclectic collection of contemporary urban art will be exhibited and sold off the walls †which †be constantly changing throughout the duration of the exhibition to create a curiosity with the viewer. This exhibition showcases a collection of international artists who examine the genre’s explorations into art in mediums that range from painting, wheat-pasting, and collage to drawing and sculpture.